It’s February which means the world is abundant with themes of love, whether it’s with a mate (soul- or otherwise) or with yourself. While I’m not going to preach self-love (though it is a wonderful thing to love yourself), I am going to share my thoughts on self-care with you, which paves the way for happier, healthier, more joy-filled you and shows that you have at least a little bit of self-like going on in there! 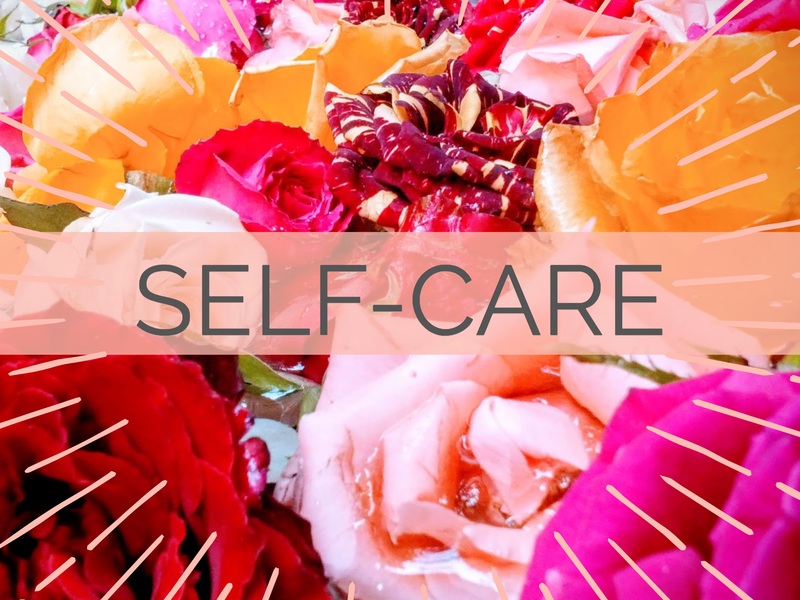 Self-care doesn’t have to be hard, but it does start with ensuring you dedicate some time to yourself each day, even if that time is 2 minutes, 5 minutes, 10 minutes. Be realistic – you have that amount of time to dedicate to yourself. Make YOU a priority, and make it happen. I’m including this long list of ideas not so you get overwhelmed and say, “Oh, but Courtney, there’s no time for all of this!”, but so you can find just one that resonates with you, pick it, and work it into your day. These are some of my favorite ways to ensure my body & mind feel the best they can… and no, I can’t manage to work all of them into my day every day either, but I get at least a few! Morning coffee: Any morning drink, really. The important thing here is instead of pouring that morning beverage into a to-go cup and zooming on into work, you take a few moments to enjoy and savor the drink, and the company you enjoy it with. Whether I’m home alone, or I’m enjoying a cappuccino with my husband, it’s nice to sit for five minutes, marvel at the sunlight streaming through the windows as day breaks, listen to a song or two, and enjoy the moment. When I’m not in the mood for coffee, I usually do hot water with lemon and coconut oil (sounds weird, tastes delicious!) or tea. Connection is important to us humans, whether we like it or not. So connect with your loved ones, or with yourself, even if it means waking up 10 minutes early to make time for this ritual. The 3 N’s – Neti, Nauli, Nasya: These three cleansing practices keep my respiratory and digestive systems working at their best. When I add all 3 of these practices to my morning it takes about 10 minutes to rinse my nose, churn my stomach, and oil the nasal passages. I don’t do these every day, but when I do, I feel much, much better. Dry brushing: Dry brushing before you hop in the shower helps slough off the dead skin and it stimulates the lymphatic system, an important part of your immune system. Not to mention it feels wonderfully energizing even before you hit the warm water. Oils & Lotions: Much like dry brushing, the stimulation of rubbing in oils into the skin stimulates the lymphatic system as well as nourishes the largest organ of your body. If you’re not sensitive to scents, you can find a lotion with a smell you love or mix up your own blend of oil by getting a base oil (my favorite is almond as it’s not too heavy) and adding a few drops of your favorite essential oils to it. I often use my Exotic Forest blend, because much like walking in a forest, it feels simultaneously energizing and calming. Get Outside! It’s amazing what a few minutes of fresh air, sunshine, something green can do for you. Not only does it feel good, but researchers have found taking a stroll through a natural setting can boost your performance in activities that require sustained focus. So if you have a trail or a park nearby, there’s no reason not to take that 10 minute break and go for a stroll. Otherwise, do the next best thing and find a few moments to meditate on a nature scene. Yoga: Ummm, hello! You are reading a newsletter from Om Fairy, and yoga is an integral part of my self-care routine. It doesn’t mean I have to go to a class or do a big power yoga session or even ensure there’s some of those deep backbends I love so much in my practice. Sometimes my practice is simply laying in bed, breathing deep, diaphragmatic breaths and stoking my parasympathetic nervous system by lengthening my exhale. Whether you take five minutes to go through a round of sun salutation, you take 25 minutes to do a yoga nidra session, you practice a pose to kick your digestion into gear, or you get a long, leisurely 75 minute yoga practice in, it all counts. I have a morning practice and a bedtime wind down practice that I attempt to work into my daily routine, and if they’re there more days than not, I’m feeling top notch. Make time for lunch and/or dinner: We’re back to the art of connection again, this time with yourself, with others, and with the nutrients you put into your body. Take the time to make a meal, or at least to sit down away from phones, computers, work, distractions and really enjoy what you are eating. Whether it’s “healthy” or an “indulgence” you should enjoy it! Yes, these services cost money, and yes, they take time, but I’ve alleviated more than one chronic health issue with their help, which means less sick days, less drugs, less feeling bad, and well worth the cost. Whether you try to work in a massage or acupuncture session once a week, once a month, or even once a quarter or year, taking the time to work out the tensions and quirks you accumulate in life helps you feel better. Massage: Massage has helped unwind so many of chronic pains and knots I used to carry in my shoulders and back, as well as develop a much deeper awareness of the patterns and imbalances in my body that helped those knots develop in the first place. Chiropractic care: I admit, I was a skeptic when it came to the idea of trusting someone to manipulate my spine and neck, but l followed up on a recommendation for a chiropractor and he let me be me and ask all the questions in my super-direct way (“How do I know you’re not going to kill me?”), and he answered them. Even though the initial reason for seeing a chiropractor was to alleviate the neck, shoulder, and back pain I was working on in my massage sessions, I realized after some time, I wasn’t having migraines anymore. Or even headaches, both of which I’ve suffered with since middle school. Plus the chronic tightness of the muscles began to fade away too. Acupuncture and Cupping: A more recent addition to my self-care routine, cupping is something I realized helped with the congestion I tend to hold in my chest after a crazy session with a woman in Costa Rica that, while clearing, made me a little scared for my life (lots of “tapping” and acupressure in that session – ask me about it sometime, it’s a funny story… and I’m alive!). Luckily my foray into exploring cupping and acupuncture in the Bay area has been less dramatic and the results have been wonderful. I’m finally getting a good handle on respiratory issues that have always bothered me seasonally, and the season just never seems to end in California. Float, steam, sauna: These are the fun, make-me-feel-good therapies that if you’re already a member at a gym, why not utilize the facilities? If heat is an issue for you, though, I’ve found floating to be a wonderful way to discover a lot of the same benefits I get from a sauna and more. Spending an hour in the dark, floating effortlessly in a pod of epsom salt, you emerge not only with the mind a little clearer from the quiet time alone, but you’ll feel a sense of relief in those areas of your body that have a hard time letting go because they’ve rested in the almost weightless environment. The Om Fairy studio is located inside of Dimensions in Health on the border of Campbell & Willow Glen, CA. Plenty of parking is available behind the building, just off of Grace Avenue.